Since 1984, Saf-T-Swim’s goal has been to teach vital water safety skills year-round. Our caring, dedicated teachers specialize in Individual (1-On-1) Swimming Lessons, that provide children the ability to learn to swim at their own pace. Students have their teachers undivided attention for the entire 30 minute lesson in 88-degree heated pools. We offer Baby and Me Programs, Private Birthday Parties, Swim Team, and more! Year-round swimming instruction is the best way to protect your child from the very real danger that any pool and body of water can pose. We encourage babies to be introduced to water safety as young as 2-months-old. In fact, Babies 2-6 months swim FREE in our Individual (1-On-1) Swimming Lesson Program. This early stimulation aids physical, mental, and emotional development. Year-round swimmers build and retain life-saving water safety skills. 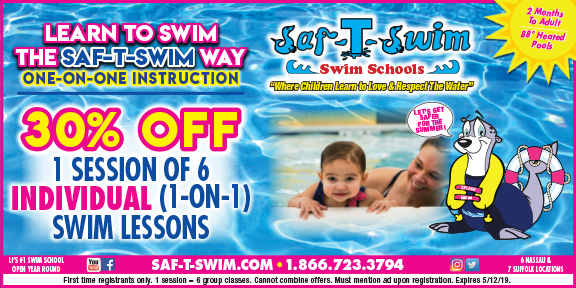 A Saf-T-Swim pool party is a great way to celebrate year-round! You and 24 guests will enjoy two hours or more of fun in our 88-degree heated pools, followed by a celebration with pizza in your own private party room. Invitations, party host, lifeguard, thank-you cards included.